The UK Project Racing team totally dominated Race 2 of the Giltinan 18ft Skiff Championship to score an impressive 2m2s win on Sydney Harbour today. 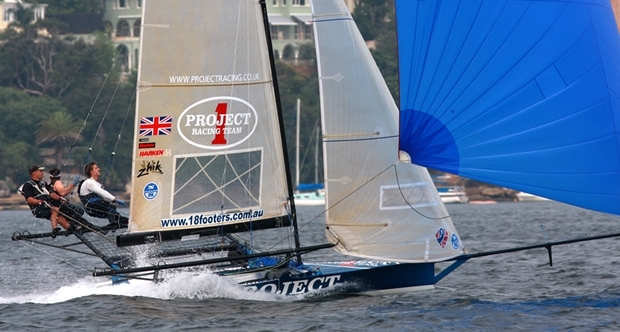 Project Racing’s team of Andy Budgen (Scotland), James Barker (England) and Matt McGovern (Ireland) grabbed the lead shortly after the start and were never headed as they powered away from the world’s best 18 Footer crews. As the winner crossed the finishing line at Clarke Island the second placed Thurlow Fisher Lawyers (Michael Coxon, Aaron Links and Trent Barnabas) had just gone around the final wing mark off Shark Island. The finish for the next four placings was a highlight of the race as Rag & Famish Hotel (John Harris, Scott Babbage and Peter Harris) came from a seemingly hopeless position on the first lap to finish third, 35s behind Thurlow Fisher Lawyers. Australian champion Gotta Love It 7 (Seve Jarvin) was fourth, followed by Benny/PSP Aust-Asia (Rob Greenhalgh) and Smeg (Nick Press). Only 10s separated those four boats after a hectic two sail reach between Shark and Clarke islands. After today’s race, Thurlow Fisher Lawyers holds the lead on 4 points, followed by Gotta Love It 7 on 7 points, Project Racing on 8, Benny/PSP Aust-Asia 11, Yandoo (John Winning) 16 and appliancesonline.com.au and Slam (Grant Rollerson) on 19. Once again, dark skies, early rain and light winds looked to be the order of the day before a light north east breeze provided good conditions for the race. Project Racing led Benny/PSP Aust-Asia by 15s at the first windward mark, with Thurlow Fisher Lawyers in third place ahead of Smeg, Gotta Love It 7 and Gill, skippered by Dave Alexander. Team Gill Sweden (Anders Lewander), Rag & Famish Hotel and appliancesonline.com.au all gybed soon after rounding the mark but the move was unsuccessful as the trio lost considerable time to most of the fleet. The leading placings were unchanged at the end of the first lap although Project Racing had increased her lead over Benny/PSP Aust-Asia. At that point Rag & Famish Hotel was well back in the pack – around 14th position. Over the next two laps of the course Rag & Famish Hotel worked her way through the fleet for a well deserved third placing.